It all began as a creative outlet for my love of writing thirteen years ago. 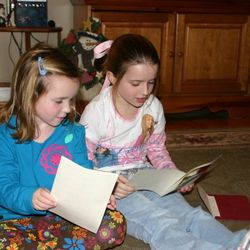 Trying to come up with unique and fun Christmas gifts for my friends' children, I decided to send each of them a very personalized letter from Santa. I wrote 18 letters that year and as they say, the rest is history. So here I am now, a decade and change later, still writing letters to children from Santa Claus and loving every minute of it. I truly get just as much enjoyment from writing the letters as the children do in receiving them. 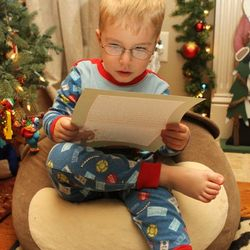 Regardless if this is your first year ordering a letter from Santa or your 13th year, no two letters will ever be the same. Yes, I really do keep a copy of every letter I've written to a child from Santa. My office morphs into Santa's Village South from September to December as the letter writing begins and with it, my imagination takes off, thinking up exciting and comical happenings that take place at the North Pole. Each year I choose a local child whose parent has ordered a letter and I deliver their letter personally. Well, the elves do. Once I'm done setting up, their front yard looks like the Elves were there, complete with snow, lights and of course, the long anticipated Letter From Santa. I never tell the child or the parent(s) that I am going to do this - that way everyone is surprised. If I know the family, I get grandmas, aunts, cousins or uncles involved to help keep the child and the parents in the dark. I'm not sure words will do justice to describe the excitement of doing this each year. What Will My Letter Include? 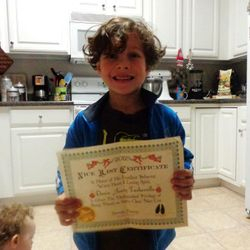 A very personalized letter from Santa Claus, filled with details about what your kiddo has been up to, their accomplishments during the past year and any mischief they may have gotten into. 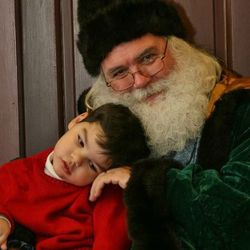 Santa has been know to persuade even the most hard-headed little one to go to bed on time and put their toys away. The more information you provide, the more personalized your child's letter will be. 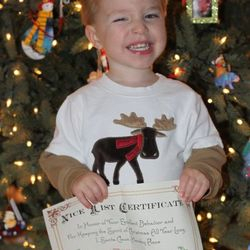 Each Christmas letter arrives in an envelope addressed to your child with the seal from the North Pole Postal Palace. Santa also includes the page number that their name is located on in his Naughty/Nice Book. 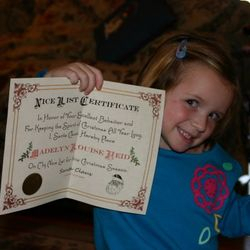 A Naughty or Nice Certificate (parent's choice), with your child's name. 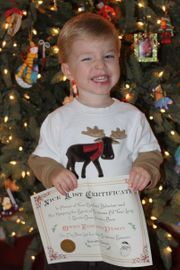 Each certificate is signed by Santa and one of the reindeer. to schedule an Elfin Delivery! 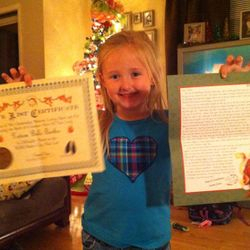 Each year I donate 5 Santa Letters to children whose family cannot afford one. If you know of such a child, please complete the contact form below. I think my favorite thing about doing this is seeing all the sweet smiles my letters bring to children. "Christmas doesn't come from a store, maybe Christmas perhaps, means a little bit more."